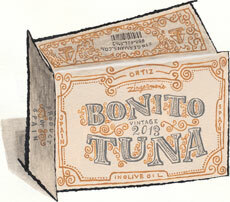 2013 Vintage Ortiz Bonito Tuna for sale. Buy online at Zingerman's Mail Order. Gourmet Gifts. Food Gifts. A new lease on flavor. Vintage, that means old. Old seafood. I know what you’re thinking: Mo is trying to sell me old seafood, what does he take me for? I know, it seems like a ruse. Unfresh fish is pretty much the opposite of everything we’ve ever learned about eating from the sea. But just as fresh grapes, when preseved as wine, have a new lease on flavor, so does fish. Many seafaring cultures around the Mediterranean treat tinned fish as a high form of seafood, and aged versions of those tins have even more value. When done right, good fish—those that are caught with care, cleaned quickly, trimmed by hand and tinned in olive oil—can get more flavorful, more silky, more delicious with age. The loin is the big working muscle of the tuna, which can get ticky tacky firm when young, softens up to silk when aged. These ones, from Ortiz, are line caught one by one by hand in Spain’s Bay of Biscay. I traveled to Spain to select this tuna catch from 2013. For the last half a decade, we've held onto 5,000 tins of it, resting and getting better. Get yours quick, they’ll be gone in a flash.